Wow! I can't believe it's been a while since my last blog post. I've been very busy creating lots of artwork (including another book dummy! I'll post about that soon). Three weeks ago I attended SURTEX and the National Stationery Show (ICFF briefly too). It was a great experience! I was so lucky to help out the wonderful and talented Rosie Simons at her booth. Rosie is such a great designer and I love her use of pattern and colors! She is also such a sweet, wonderful, cheerful person. We had a great time together. I had walked SURTEX, the NSS and ICFF twice before, but this was my first time helping out with an exhibitor's booth. It was such an eye opening experience in the best way possible. I have long dreamed of having my own SURTEX booth, but felt too lost. I didn't know where to begin, or how to best show my work, or even how much work I needed to show. I learned so much about how to prepare my work, what type of work to show, how to go about the more business side of things, and much more! Many MANY thanks to Rosie for teaching me so much! Have patterns and images to license AND sell. Some buyers are only interested in buying outright. Speak up, smile and be friendly - you never know who you will meet! It's great if you have some physical products to show along with patterns in books. It's important to draw people into your booth - the walls can only show so much. Have a plan for writing down and keeping track of people's information. Do much more than just collect a business card. The food in the Javits center is expensive. The two days I was there I walked out to a Halal truck (a true NYC experience) and brought a sandwich from Subway. Also bring water and snacks. 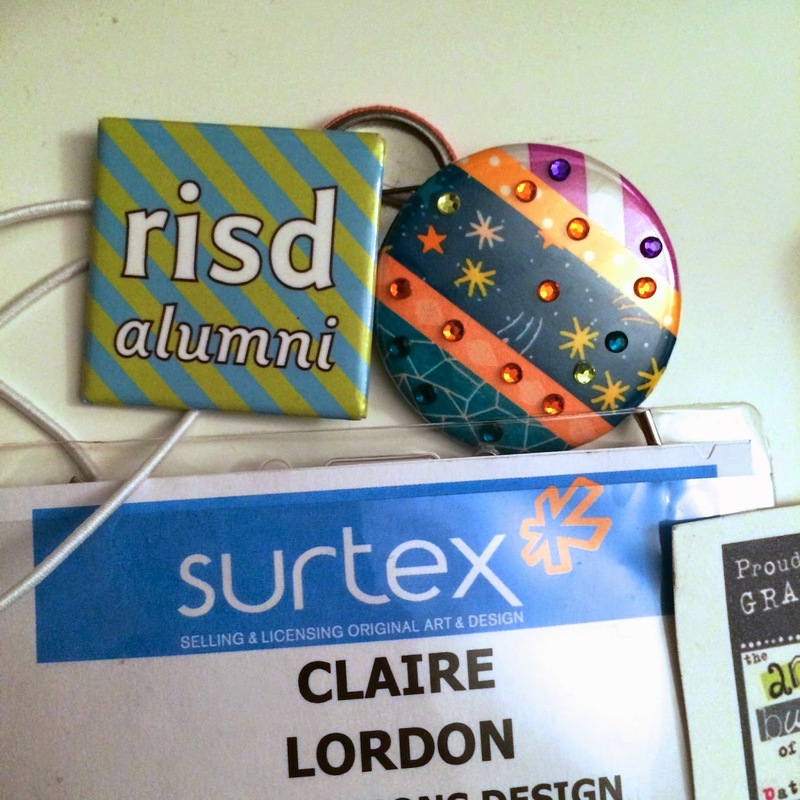 I found that putting my RISD alumni pin and Make Art That Sells icon badge on my exhibitor badge opened many doors for me. People automatically had something to talk to me about. Also wearing something that matches your booth is a conversation starter. Have help - this cannot be overstated. You will need someone to help set up your booth, take it down, and be there when you need to take a restroom break. Also sometimes more than one client will come to a booth at once. Mingle with your fellow designers at the happy hour - it was so much fun meeting people from all over the world and hearing about their design experiences. Take breaks, especially if you are walking the show. There is so much visual information you can feel like your head is spinning. Take some time off in the cafe or down by the windows to decompress once in a while. After helping out Rosie with her booth I have the confidence that I can have my own booth too. It was the perfect bridge for me from being a walker of the show to possibly being an exhibitor next year. 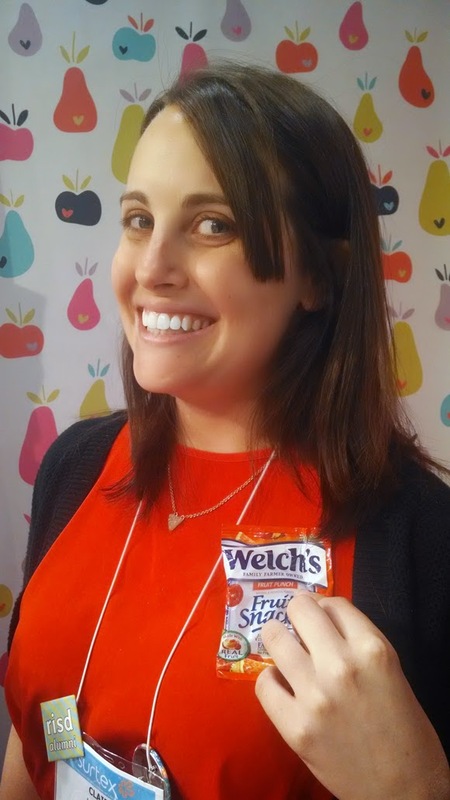 Here is a photo Rosie took of me while we were eating a yummy fruit snack with packaging that matched my dress. This year was also the first year I participated in SURTEX's workshops. I took the stationery and greeting card workshop since I have my own Etsy store and have been licensing designs on Open Me (a greeting card and ecard company). It was very helpful to learn more about the greeting card business, especially on how to submit work to companies, as well as trends, pricing, and more! I was also able to meet some of my online classmates from courses I have taken- Lilla Rogers Make Art That Sells Course and The Art and Business of Surface Pattern Design. Some of my classmates had booths and it was great to meet them in real life and see their wonderful work. This is a great recap, Claire--thanks for sharing about your experience! I look forward to visiting your booth next year!! Great post thanks for sharing! and wishing best of luck for Surtex 2015… you go girl!